We’re excited to announce the release of new mobile apps for the iPad and Android. Together, these new mobile apps enable small business users to collaborate, meet and present to users across devices and platforms, from PC to Mac, desktop to mobile, and iOS to Android. The AnyMeeting iPad and Android apps enable meeting attendees to join webinars, online meetings and web conferences via their iPad and Android tablets. Users can attend meetings, chat, view shared presentations and applications, and participate in video conferences. The iPad app is available now in the iTunes store and the Android app is available for download in the Google Play store. AnyMeeting is a full-featured web conferencing and webinar software platform for small business, featuring 6-way video conferencing, phone conferencing, screen sharing, application sharing, chat, polls, meeting recording and more, plus support for up to 200 participants. AnyMeeting offers all of these features in both its completely free ad-supported service and low-cost ad-free options. To demonstrate AnyMeeting’s unique value to small business users, the company is currently running a major national promotion through May 1, 2013 targeting small business customers of GoToMeeting and WebEx: switch to AnyMeeting, and get six months of AnyMeeting’s most comparable ad-free Pro plan for free. HUNTINGTON BEACH, CA– Apr 2, 2013- AnyMeeting (http://anymeeting.com), a leading provider of web conferencing for small business, today announced the launch of an aggressive campaign taking on WebEx and GoToMeeting in the small business market. Having grown to over 300,000 small business users mostly through word-of-mouth, the fast-growing Southern California company is now taking on the big guys directly with its solution specifically designed and priced for small business. AnyMeeting is offering a promotion specifically for small businesses that are currently using WebEx and GoToMeeting. Any small business owner, employee or independent professional interested in participating can simply provide a copy of their most recent WebEx or GoToMeeting invoice, and they will receive AnyMeeting’s most comparable ad-free plan — free for six months. AnyMeeting provides a full-featured solution to address the complete range of small business needs. 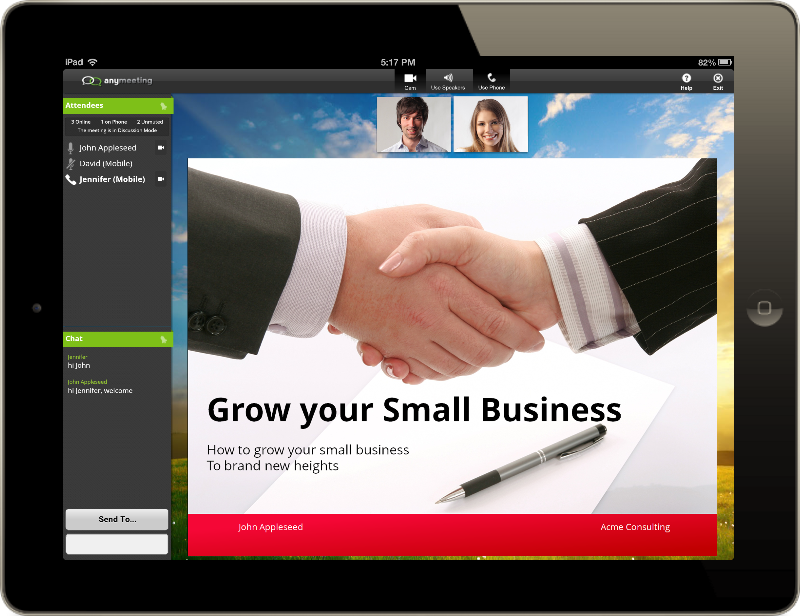 It offers 6-way video conferencing, conference calling, built-in VoIP, screen sharing, presentation sharing, recording and mobile, as well as additional features uniquely important to small businesses, such as persistent personalized meeting URLs, social media integration, personal profile pages and webinar ticketing. It’s also priced for small business, at about half the cost of most enterprise solutions. More information on this promotion is available at http://anymeeting.com/six-months-free. Based in Orange County, California, AnyMeeting pioneered the small business web conferencing market in 2009 with a completely free, full-featured and easy-to-use web conferencing service tailored for small business. Since then, it has grown to more than 300,000 small business users of both its free ad-supported service and low-cost ad-free options. Designed specifically for small business, AnyMeeting offers a complete web conferencing and webinar service built on the company’s proven Software as a Service platform. Meeting hosts are able to invite up to 200 attendees per meeting with no time limits, and enjoy a full range of features including integrated video conferencing, screen sharing, presentation sharing, recording and social media integration. AnyMeeting is the best choice for small businesses, independent professionals and just about anyone who can benefit from online meetings. Current investors include Tech Coast Angels, Pasadena Angels, Maverick Angels, Sand Hill Angels and Keiretsu Forum. For more information, please visit http://www.AnyMeeting.com.